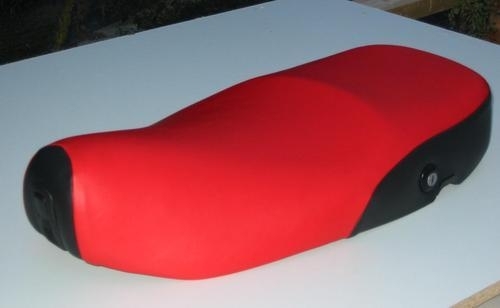 Elite Comfort Seat Motorcycle Memory Foam Inserts at Sussexmotorcycles.com, better than gel pads for rider comfort. -- BRING YOUR BIKE IN AND WE WILL FIT THE SEAT TO YOU! We specialize in upholstering and modifying motorcycle seats only. Seats recovered or re-upholstered while you wait in plain colours. We offer the Elite Comfort Motorcycle Seat to improve rider comfort. We have moved on from gel seats, and are now using memory foam, as it gives superior results. 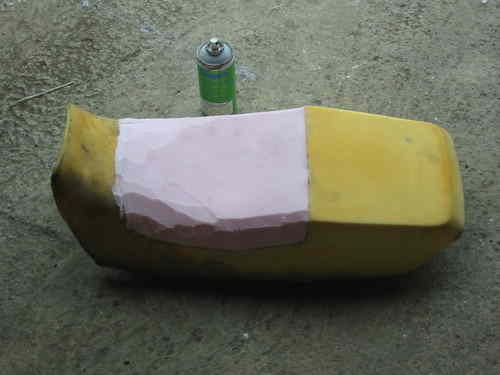 A special high-grade memory foam seat pad is inserted into the seat, and the seat is recovered. This greatly improves rider or passenger comfort on long journeys, and is obviously especially welcome to those regular riders suffering from numb bum syndrome. The results in our experience are more economical and more comfortable than gell seats and pads. We have tried gel, and have found that our special grade of memory foam gives better results. It is more comfortable and it is also easier to re-contour the seat shape if that is required. We can offer fast turnaround on mail order seat modifications, and, subject to appointment, can normally offer a while you wait service, please telephone for details. Don't be fooled by the higher prices charged by other seat companies. We take pride in offering a simple and effective solution to numb bum, and it is actually better and more effective than other products offered. It is certainly better than gel. Memory foam can be used all over the whole seat, not just in one area, can be used to change the shape of the seat, and it doesn't degrade and leak over time, as does gell. We guarantee a simple and effective solution to uncomfortable motorcycle seats. Bespoke service, seats lowered, raised, re-contoured, etc. etc. 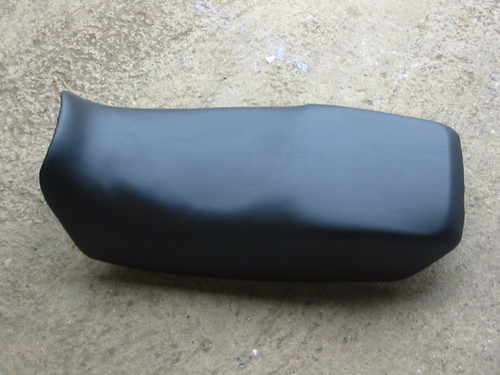 Every motorcycle seat is different, as are customers' requirements, so please contact us with your enquiry. 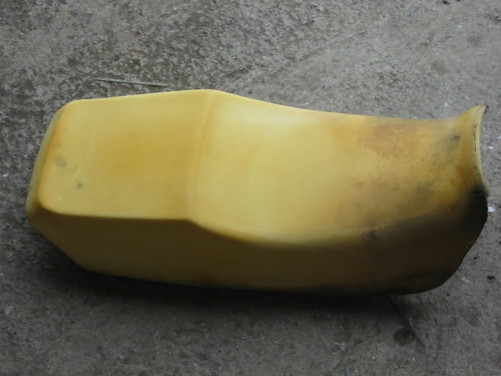 The memory foam insert can be incorporated within the original motorbike seat foam when that is thick enough (see photos above), which will preserve the original shape, style and contour of the seat. The original cover can be re-used and visually the seat will look standard. Alternatively the existing seat foam can be built up or lowered as required, or re-shaped completely, and a new cover fitted. Seats can be recontoured to the customer's requirements. If you can come in with your bike, we can reshape the seat to get your ideal riding position. The seating area can be moved up or down, backwards or forwards, or the slope and shape changed to suit your riding position. Within the limits of the bike's design, we can normally achieve marked improvements in rider comfort. Choice of two non slip "grabber" or "Gripper" materials is available for recovering whole seats, or incorporating panels into seat covers. Helps stop the rider or pillion passenger sliding about on the seat. Above is the normal non-slip "grabber" material, below is the finer textured non slip gripper material. -- UK return service for a dual seat, normally by Hermes courier and with £100 cover, £10. This includes insurance for loss up to £100, if you require more we can up the insurance, but there will be an additional charge to cover the extra charged by the courier (we will only charge the extra that the courier charges). We will only be liable for the value of parcels lost in the post to a maximum of £100, unless the extra insurance is paid for. Every seat job is different, so please ring to discuss your requirements, we will not reply to email enquiries about seats, it is too time consuming and boring to send emails backwards and forwards. 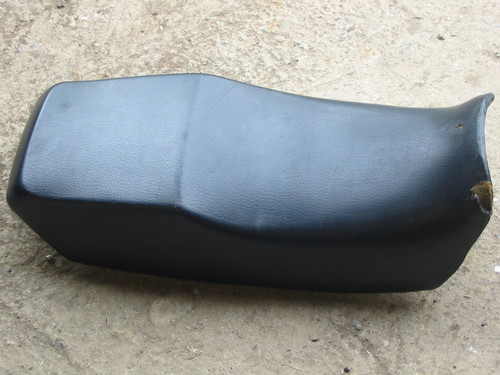 Most manufacturers offer gel or comfort seats as an extra for their motorcycles. These are often not much of an improvement over the standard seats, and some customers even find them worse. We get quite a few of these in, to actually make them comfortable. The reason that they are normally no more comfortable than the original seats is fairly obvious in the photos below! These show a dissection of a few manufacturers' comfort seats, showing what is actually in there. When we modify these seats, we put in a broad area of memory foam that is not 8mm thick (like the gell in the ones below that actually have anything in them at all), and which covers the whole seating area, not a small part of it. These manufacturers' seats are not much of an improvement on standard at best, not only do they rely on gel which is pretty much ineffective anyway, but there is not much (if any) of that in the seats either. 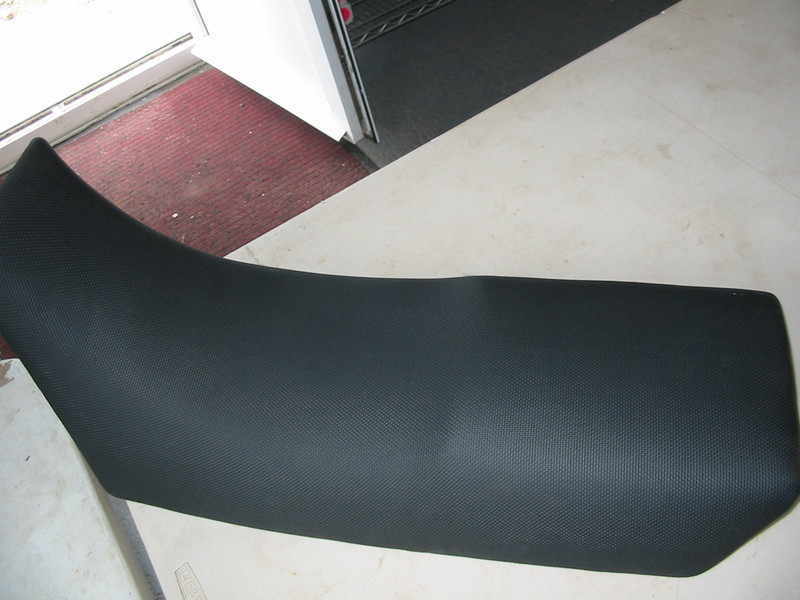 We guarantee to make a more comfortable seat than any of the motorcycle manufacturers, for a lower price! Is memory foam better than gell? 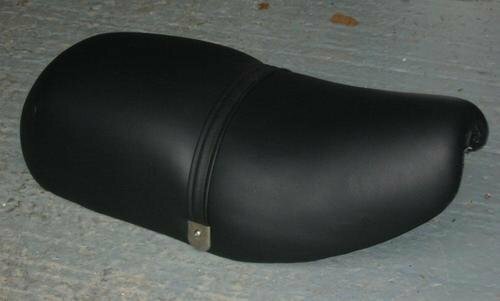 Sussex Motorcycles offers a handmade, bespoke comfort motorcycle seat re-contour, reshaping, and upholstery service. Our seat service will rival any UK comfort motorbike seat service for quality and comfort, whether memory foam or gell pads or Jell. Do not be fooled by the vastly higher prices that some other upholstery companies charge. We specialize in motorcycle seats, and only do motorcycle seats, and our value for money is unbeaten. In our experience memory foam offers significant improvements over gel or Jel, in terms of comfort, appearance, and ease of coverage. We have tried gell (jel), and with memory foam have achieved a better level of comfort. It is actually easier to sell gell seats, as "gell" is a buzz word, but we have been unable to get gel to actually give much improvement in rider comfort in practice. Our special grade of memory foam is superior. It does work and it does markedly improve comfort. It is also much more flexible in how it can be incorporated into bespoke seats, and to produce the exact shapes and contours required by the customer. In other words, as well as improving comfort levels, we can also use it to produce the various seat shape modifications required by customers' needs more easily than gell. We can lower seats or raise seats as required, or move the seating area back or forwards or alter the angle, and get the seating position and angle how the rider wants it. 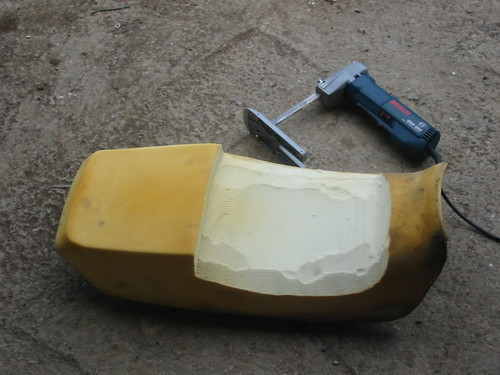 Higher or lower motorbike seats can easily be made by adding or removing foam. We also offer simple seat re-upholstery or recovering with fast turnaround. Our seats our handmade, we have fast turnover times and can modify seats while you wait, subject to pre booking. Mail order return post to the UK, with express delivery is £10 UK wide. 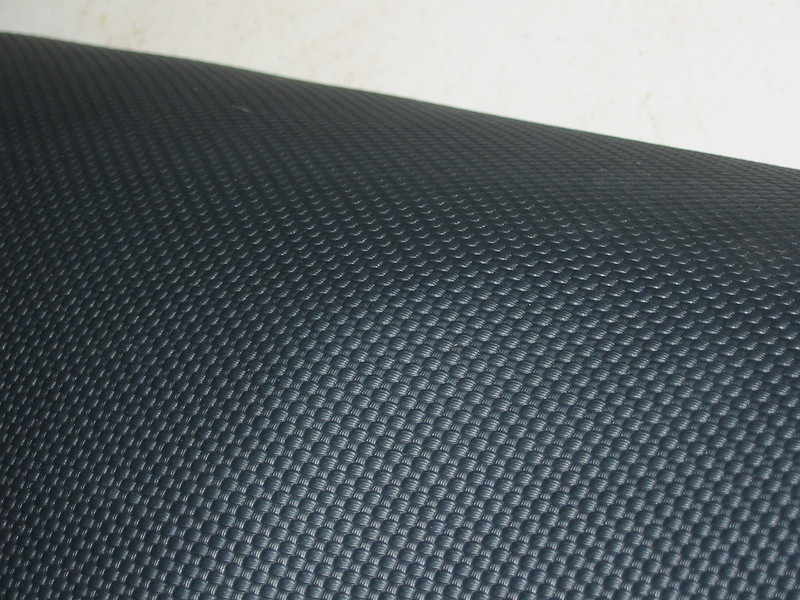 We have a good range of vinyl seat materials in stock, including non-slip and textured materials. We service customers in person from the local markets of Sussex and Kent, as well as London, and welcome visits from customers for our express turnaround and a while you wait service for simpler jobs. Give us a ring and drop in and we will sort out your seat!